Stone is a popular choice for kitchen accents because it is durable, beautiful and easy to clean. Learn how to incorporate stone into your kitchen design for a timeless look. 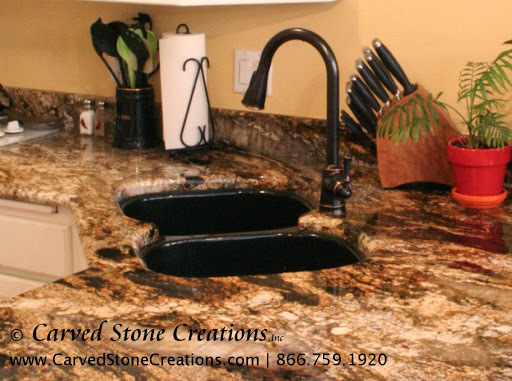 Granite kitchen sinks are becoming a popular choice for many homeowners. Replace your stainless steel or porcelain sink with a unique handcarved granite sink. Granite is one of the most durable stone types, so your sink is able to handle everyday wear and tear. Kitchen sinks are available in single or double basin styles depending on your needs. If you like a sleek kitchen design, you may like an undermount sink style, shown below. Apron-front granite sinks are also available. For a rustic look, choose a rock-face style. Apron-front sinks can also have carved details on the front. Shop our granite sink selection. A stone kitchen hood takes your kitchen design to the next level. A handcarved stone kitchen hood is the perfect focal point for a kitchen. Stone hoods can have intricate carved details or sleek, simple lines. They can be carved from many types of stone, including travertine and limestone. We can custom design a kitchen hood to match your homes decor. Contact us to get started designing your custom kitchen hood. 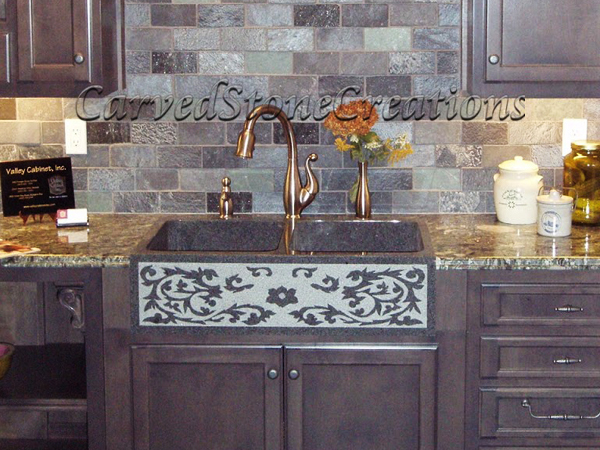 A traditional natural stone backsplash is another great way to add stone to your kitchen. Natural stone tiles can be arranged to form any design  from simple staggered patterns to complex mosaics. Tile can also be used for kitchen flooring. There are an endless number of combinations of colors, shapes and tile configurations to make your floor one of a kind. If you are interested in adding stone to your kitchen, please contact us.